But as a father of daughters that were virtues. Our Venerable Father Pappos was the first Bishop of Chytri (mod. 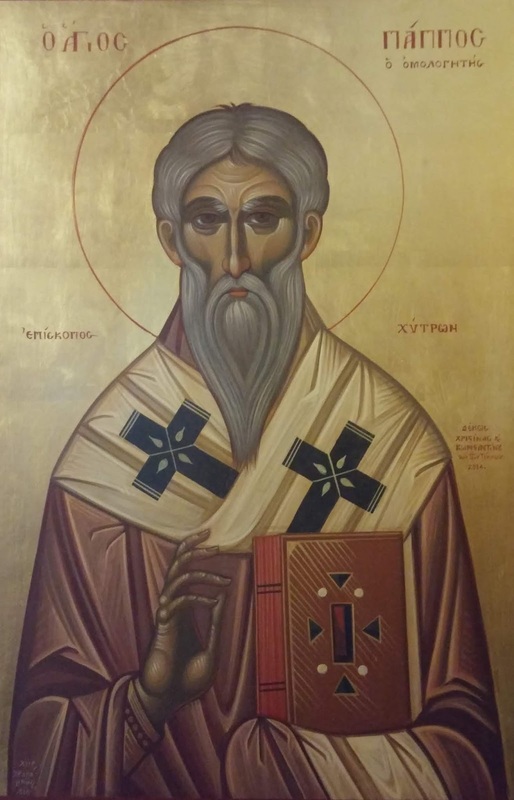 Kythrea) in Cyprus and is known to us from the Life of Saint Epiphanios of Salamis. There we are told he was Bishop for 58 years of an insignificant town, who was revered by all for having suffered during the persecution against the Christians. Pappos was made Bishop in the year 309. The meeting between Pappos and Epiphanios took place in the following manner. After Epiphanios converted to Christianity from Judaism, he entered a monastery in Palestine at the age of sixteen and was instructed in the Christian faith by a certain holy hermit named Hilarion. Some years later, in the year 367, the captain of a ship arrived in Caesarea from Paphos in Cyprus, who informed Epiphanios that Hilarion now lived in a cave near Paphos. Epiphanios at once took his two friends John and Polybios and set out on ship to search from his old spiritual father. There was great joy in their meeting, and after two days together Epiphanios resolved to return to Palestine. Hilarion advised him to go to Salamis in Cyprus instead, assuring him that he would find there a place to dwell, and warning him that a voyage to Palestine would bring him great peril. When Epiphanios arrived at the coast, there was one ship bound for Ascalon in Palestine and another for Salamis. Contrary to Hilarion's advice, they embarked on the former ship, but scarcely had they left port when a violent storm arose that put them in mortal danger. After four days of contending against the storm, the ship arrived in Salamis, exhausted from what they endured. There repairs were made to the ship before it would set out again for Ascalon. While Epiphanios was in Salamis, the Bishops of Cyprus were gathered there to elect a successor to the now reposed Archbishop Gelasios of Salamis. There they had prayed that God would reveal to them a worthy successor. A divine revelation came to the venerable old man Pappos that Epiphanios should be the next Bishop of Salamis, even though he was just a monk. It happened to be the season when the grape harvest was approaching maturity. Before sailing, Epiphanios proposed to his companions that they should go into the market and buy grapes. He had just chosen two very fine bunches and was in the act of paying for them, when the venerable Pappos drew near, his tottering form supported by two deacons and attended by three Bishops. Addressing Epiphanios he invited him to leave the fruit with the merchant and accompany them to the church. The latter accepting the invitation, Pappos on their entrance requested him to offer prayer, when he excused himself on the plea that he was not a clergyman. The words had scarcely left his lips before one of the deacons by force dragged him to the altar, where, after rapidly passing through the grades of deacon and priest, he was consecrated Bishop. At the conclusion of the ceremony they went to the episcopal residence, where Pappos informed him to address the fathers as their spiritual head. The newly-consecrated Epiphanios begged him to be excused, until Pappos revealed to him that he had been divinely chosen to lead the flock of Salamis and all Cyprus. Saint Pappos reposed a year later in 368. You became a blessed shepherd of Chytri, Pappos, and possessed wonderworking power, whereby you glorified God, having brilliantly lived in Cyprus. Wherefore remember us all who honor your memory, to grant us the wealth of the grace of life in the Spirit, and keep this island from all devastation by your prayers.